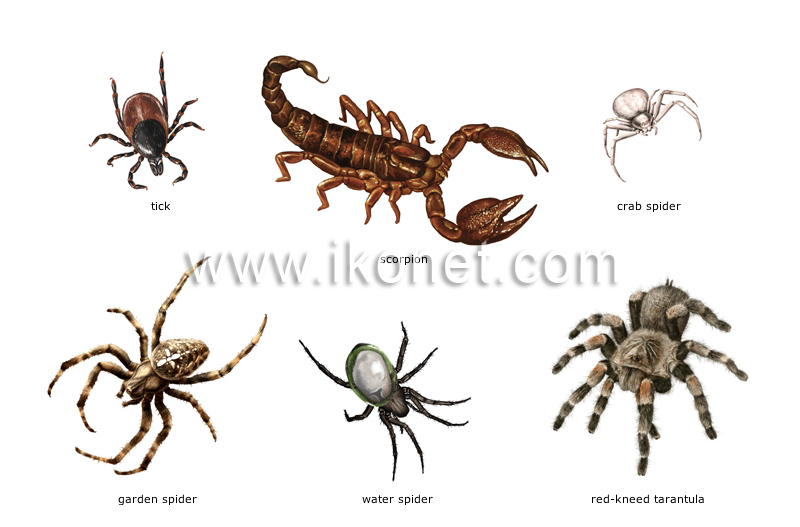 Arachnids: invertebrates usually with four pairs of legs and two pairs of appendages attached to their heads. Relatively large carnivorous arachnid with spines, usually found on land; it has pincers and its abdomen ends in a tail with a poisonous sting. Arachnid with a bulging stomach that weaves large webs and is commonly found in fields and gardens; its various species can be found around the world. Large hairy arachnid found in Mexico, having a painful but usually innocuous bite; it lives underground in a closed compartment or cocoon. Widespread small arachnid that moves sideways and has powerful front legs; it changes color to catch its prey. Aquatic arachnid found in Eurasia; to live in the water, it weaves a kind of bell that it fills with air and carries along on the hairs of its abdomen. Extremely small arachnid, parasite of animals and occasionally humans; it can transmit infectious diseases.